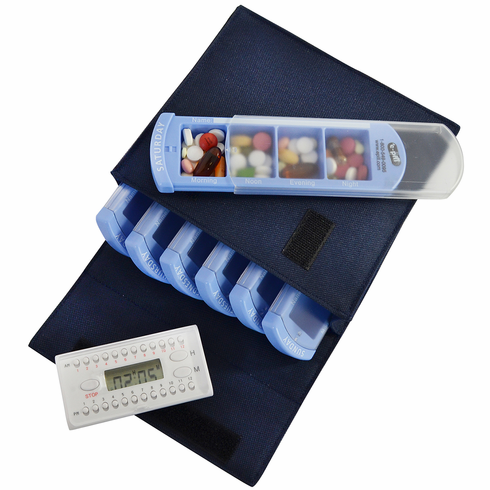 Each four compartment pill organizer is labeled with the day of the week. Convenient and compact storage case made of durable high quality canvas. The daily organizers are made of industrial strength plastic and are dishwasher safe. Tactile labeling (Braille) can be read at night. Daily organizer size: 3 1/2" x 2" x 3/4"
Color: Blue with Clear Lid, Canvas Bag is Dark Blue. Timer is White. Battery life: 3-4 Months. CR2032 Battery Included.